SP leader Ram Gopal Yadav’s MP-son Akshay took control of Delhi firm N M Buildwell from Yadav Singh’s aide. Samajwadi Party chief Mulayam Singh Yadav. Last month, when the Samajwadi Party government in Uttar Pradesh moved the Supreme Court against the Allahabad High Court’s decision to order a CBI probe into alleged irregularities by former Noida chief engineer Yadav Singh, it puzzled many. 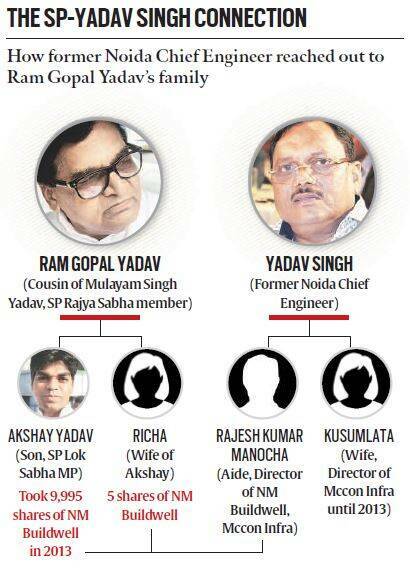 An investigation by The Indian Express shows that the family of SP Rajya Sabha member Ram Gopal Yadav, cousin of party chief Mulayam Singh Yadav and uncle of Chief Minister Akhilesh Yadav, got a sweet deal from Yadav Singh via an aide. According to the Registrar of Companies (RoC), Ram Gopal Yadav’s son Akshay Yadav — he was elected to Lok Sabha on a SP ticket from Firozabad in May 2014 — took over 9,995 shares of N M Buildwell, a Delhi-registered company, from Rajesh Kumar Manocha, an associate of Yadav Singh and a former business partner of the latter’s wife, on September 11, 2013 — months after the SP government reinstated Yadav Singh who had been suspended earlier. Sources in Finance Ministry said N M Buildwell is one of the many companies being probed by the Income-Tax department for suspected money laundering. Incidentally, when the I-T raided Yadav Singh’s Noida house last November, they found Rs 10 crore cash in an Audi parked in the house. This car, I-T sources said, is linked to Manocha. Manocha is also a director of Mcconn Infra Private Ltd, which is at the centre of the CBI probe in the Yadav Singh case. Kusumlata, wife of Yadav Singh, was also a director in the company until 2013 when she resigned. The CBI is looking into allegations that Yadav Singh allotted 30 industrial plots to Mcconn and its affiliates through bogus applications. RoC filings show that at the time Akshay Yadav took over N M Buildwell, the company had leasehold land valued at Rs 1.58 crore and a building valued at Rs 1.57 crore. But the shares were transferred at face value — the company was taken over for Rs 1 lakh (10,000 shares at the rate of Rs 10 per share). Of the 10,000 shares, Akshay had 9,995 while the remaining five shares were in the name of his wife Richa. One entry in the 2014 balance sheet of N M Buildwell — after Akshay Yadav took over shares — shows that 16,45,000 shares were to be issued at a premium of Rs 990 but “could not take place owing to instructions of the applicants to hold back allotment”. This entry forms part of the RoC filings. The share application sum of Rs 1.64 crore was also received for this purpose. This share allotment deal was to fetch Rs 164.5 crore — 16,45,000 shares at the rate of Rs 1,000 (face value of Rs 10 plus premium of Rs 990). The filings show Akshay himself subscribed to 17,000 shares issued at a premium of Rs 990. When it approached the Supreme Court on August 5, the SP government had questioned the “extreme interest” shown by the Centre in the Yadav Singh case. The UP government also pointed out that a Joint Secretary in the Finance Ministry had, in an unprecedented move, asked the state to turn over the Yadav Singh case to the CBI. The state government said the Centre’s directive was unconstitutional because a decision on turning over a case to the CBI rested with the state. While Uttar Pradesh did not entertain the Centre’s direction, the Allahabad High Court, acting on a petition filed by activist Nutan Thakur, ordered a CBI probe into the case on July 16. Meanwhile, the petitioner’s husband Amitabh Thakur, an IPS officer at loggerheads with the state, was booked by UP police in an alleged sexual harassment case after he complained that he had been threatened by Mulayam Singh Yadav.